WASHINGTON -- It's a war the so-called mainstream media apparently have decided to ignore. Though its death toll is higher than Iraq's and Afghanistan's combined, it evidently isn't worth covering; and unless you're reading this in the Southwest, you probably haven't even heard about it. The conflict, a full-blown narco-insurgency, has claimed the lives of more than 17,000 combatants and innocents, threatens to undo several democratically elected governments and poses a real and present danger to the United States. It's not the one being fought in Afghanistan. It's the war being waged from the Andean basin all the way north to the Rio Grande. Last week, while our Fox News team was in Texas and New Mexico on a completely unrelated matter, "the war next door" was the principal topic of conversation among the locals we encountered. Just days before we arrived, 16 teenagers celebrating a birthday party were machine-gunned in Ciudad Juarez, Mexico, less than a mile from the U.S. border. In the past 12 months, nearly 2,700 people have been murdered in this border city -- about 1,000 more than the previous year -- making it the deadliest place to live on the planet. The Mexican drug cartels perpetrating the violence next door are competing for "distribution rights" in the lucrative marijuana, hashish and cocaine markets on this side of the porous U.S.-Mexico border. According to current and former officials of the U.S. Drug Enforcement Administration, or DEA, the Mexican cartels -- most of them "family organizations" -- have become the "delivery service" for cocaine that originates in Colombia, Ecuador, Peru, Bolivia and Venezuela. These "distributors" are now exporting their violence, as well. According to the U.S. Department of Justice, cartel "hit teams" have carried out murders and kidnappings in more than 230 American cities. Phoenix seems headed for becoming the kidnapping capital of the U.S. Though overall violent crime has declined in Arizona generally and Phoenix in particular, kidnapping has spiked from fewer than 50 cases in 2005 to more than 350 last year. Local and state law enforcement authorities say nearly all of this increased crime is directly connected to the illicit drug trade coming across the state's 375-mile border with Mexico. When our Fox News team accompanied DEA and Customs and Border Protection agents on patrols along the border, they described "routine ambushes and shootouts" that occur when heavily armed cartel members are moving narcotics north. 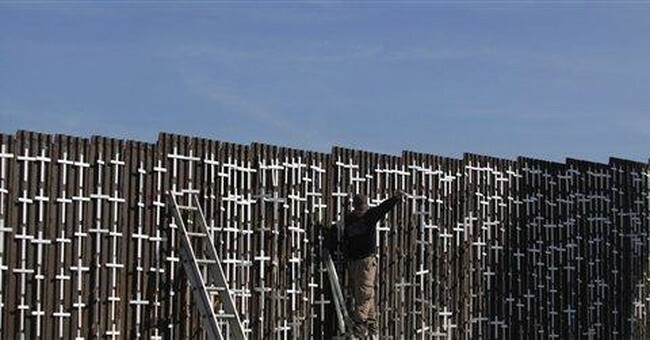 The most recent report by U.S. Immigration and Customs Enforcement predicts increasing violence as the Mexican cartels engage in "ruthless targeting of rivals." The Justice Department describes Mexican drug cartels as the "largest threat to both citizens and law enforcement agencies." The Obama administration seems to be of two minds about what needs to be done about the problem. To its credit, it has continued to fund and even expand the Bush administration's Merida Initiative, aimed at improving Mexico's internal police and security services with $1.6 billion in training and equipment. Unfortunately, Obama administration officials also speak routinely about "reforming U.S. drug laws," suggesting that having "user amounts" of illicit narcotics would no longer be a criminal offense. How that would reduce the demand for drugs in America is hard to fathom. There are other challenges the administration has failed to address, as well. Everyone involved -- from the Andean basin to the streets of Chicago -- knows that the flow of drugs north won't stop until the flow of money south is interdicted. Arizona's attorney general, Terry Goddard, recently won a major settlement with Western Union about illicit financial transactions. The departments of Justice and Treasury lauded the outcome of this contentious matter because Western Union has agreed to turn over money transfer data on suspicious transactions. Arrests and prosecutions from this information are likely. Equally certain is that the cartels will look for new ways to move money. According to those engaged in this fight, cartel bosses always are looking for new ways to move drugs and money. Unfortunately, our ability to detect cash transfers through European banking institutions suffered a crippling setback last month, when the European Commission shut down U.S. law enforcement and intelligence access to data from the Society for Worldwide Interbank Financial Telecommunication, which was so important in the aftermath of 9/11. If the Obama administration is serious about stopping the violence threatening Americans from our southern border, it needs to initiate some urgent diplomacy to reinstitute our access to SWIFT data -- and stop talking about "legalization."